Chocolates are best gift for any special occasion. 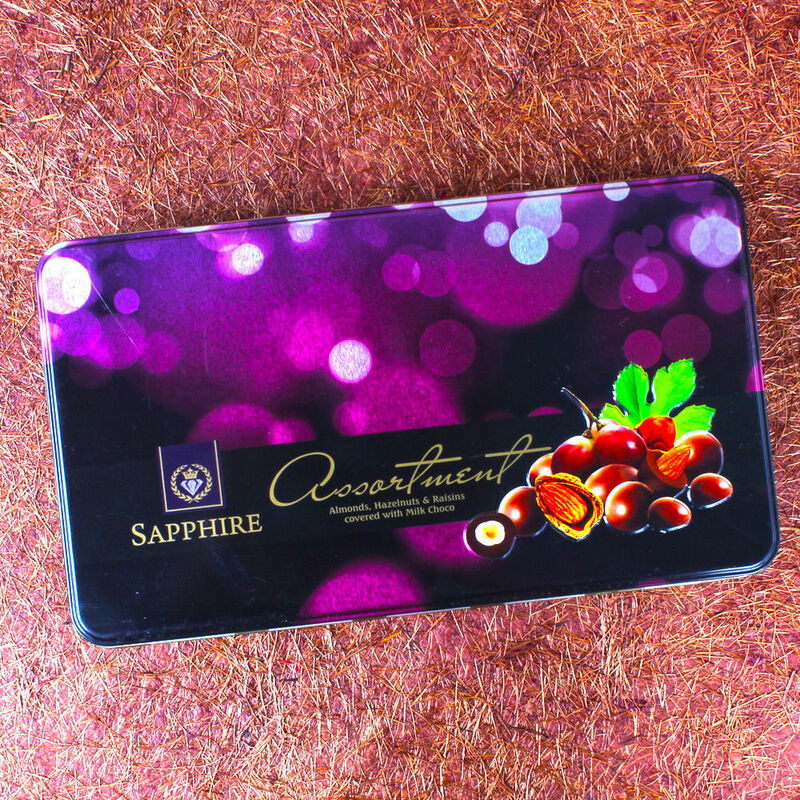 This Sapphire Assortment Chocolate contains Weight : 175 gms. There are varieties of chocolates available in the market. Giftacrossindia.com brings to you this very delicious box of chocolate coated almonds which is all set to delight the receiver. This dark crunchy almond chocolate is very luscious. All the chocolates are packed in a square shaped air tight tin box. The combination of chocolate and dry fruits is worth enjoying. Buy this delightful almond chocolate box for yourself and enjoy the heavenly taste. Product includes : Sapphire Assortment Chocolate (Weight : 175 gms). Orders Received will be delivered within 24 hours or on the date specified by the customer. Please note that Flowers, Cakes, Sweets, chocolates and other perishable products are sourced locally at the delivery location & will be hand delivered. For perishable items like cakes and flowers, we attempt delivery of your order only once. In the event the delivery is not executed during the attempt, you shall still be charged for the order and no re-delivery will be possible. We will consider the order executed in the below cases Wrong shipping/delivery address., Recipient not available., Premises locked., Recipient refusing to accept the delivery. Estimated delivery time depends on the availability of the product and the destination to which you want the product to be delivered. Delivery may take longer due to Bad weather, Political disruptions, Other unforeseen circumstances. Flowers might arrive in bud/Semi bloom/fully bloom condition as per local availability at the time of delivery. We reserve the right to substitute the flowers (Including specified color), Basket, Vase & other products with equal value or higher value due to temporary, regional availability issues.